Advertising on search engines (SEM) is an effective way to advertise your company, its products or services, when consumers are actively searching for related information. Mostly the SEM campaigns are conducted on Google, as being the most used search engine in the world, with about 90% market share, through the program Google Adwords. In addition, Google has several other websites where ads may also be displayed, such as Gmail, Google Maps, Blogger or Youtube. When users search for a topic, through certain keywords in Google, your ad appears on the top and the side of the organic search results, which means that you are advertising your business to users who are interested in the products or services you sell. The most used payment system on search engine advertising is Pay-per-click (PPC), which means that the advertiser only pays when a user clicks in their ad and enter the website. If your ad is triggered but there is no click, it is not charged any value to the advertiser. In short, you will only pay when a user clicks on your ad and come to your website. Another big advantage of advertising on search engines is the ability to segment the target audience of the campaign. For example, you can target your ads to appear only in a city, a region, or elsewhere. 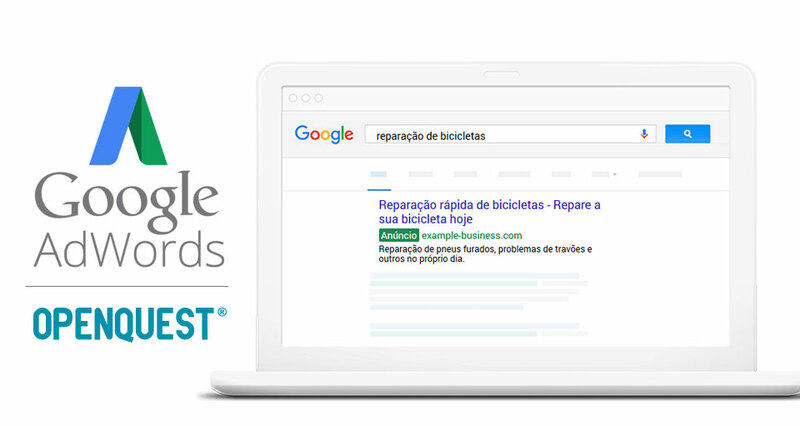 Openquest is Google Adwords Agency and it has an extensive experience in this area with collaborators who are Digital Marketing specialists, able to create effective and properly optimized advertising campaigns to achieve the highest return over your investment. Get access to all the detailed reports of the campaign. Contact us in order to obtain more information.